"This is a very easy and deliciously different cheese ball; your guests will love it! The curry and cream cheese are rich and tasty. This is best served on a hearty wheat cracker." In a medium bowl, mix together the cream cheese and chutney until well blended. Season with mustard powder and curry powder, and mix well. Chill overnight, or until cream cheese is firm. 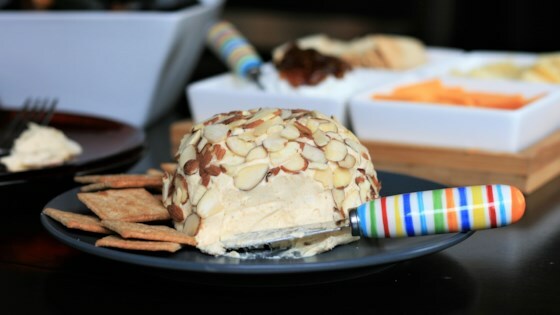 Roll chilled cheese mixture into a ball, and roll in almonds to coat. Serve with crackers or veggies. All I found for chutney was mango, I didn't add all that was called for. I found it too sweet. We all thought it was okay but not great. It is also very soft. Delicious and easy. A big hit. A little soft (even after refrigeration) to roll into a ball. I served in a bowl and sprinkled with toasted almonds. Very good and quite easy as well. I made a log rather than a ball and was quite pleased. Next time I will cut the recipe in half as it is a bit more than my family needs. I was really excited to make this as it sounded great and a bit unusual. However, it did not turn out well. Delicious! The was very easy to make and a big hit! My family loved it at Thanksgiving! I really liked this but it may have been too exotic for the guests at the party I brought it to because it was far from gone at the end of the night.